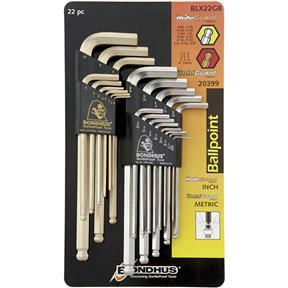 Forged from special Protanium™ steel for extra-high torque, these L Wrenches feature handy Balldriver® ends. Coated in exclusive BriteGuard (inch) and GoldGuard (metric) finish. Packaged in the patented Bondhex™ tool case that doubles as extension/ leverage handle. 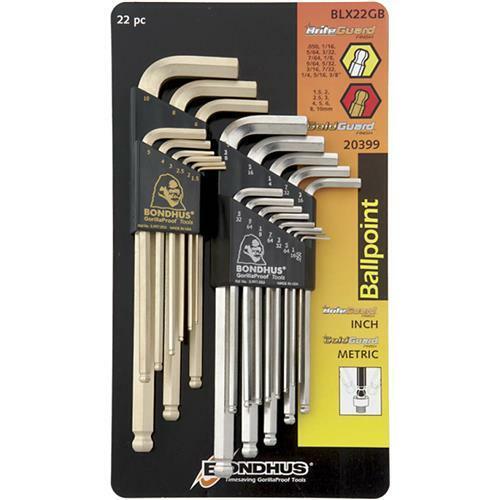 Lifetime warranty from Bondhus. Sizes: 1/20", 1/16", 5/64", 3/32", 7/64", 1/8", 9/64", 5/32", 3/16", 7/32", 1/4", 5/16", 3/8", 1.5mm, 2mm, 2.5mm, 3mm, 4mm, 5mm, 6mm, 8mm, 10mm. Lifetime warranty from Bondhus.